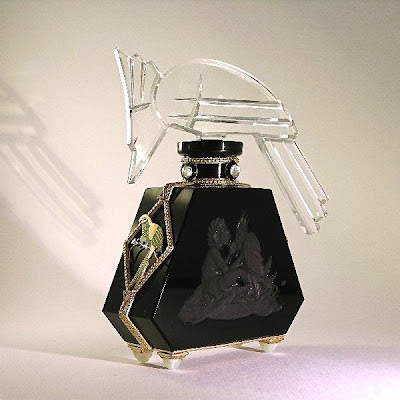 Heinrich Hoffmann (1875-1939) was one of the foremost designers of Czech perfume bottles and other glass in the early 20th century, and came from a long line of glass producers. Hoffman, and later his son-in-law, greatly influenced the bohemian glass industry with their new ideas, designs and methods. 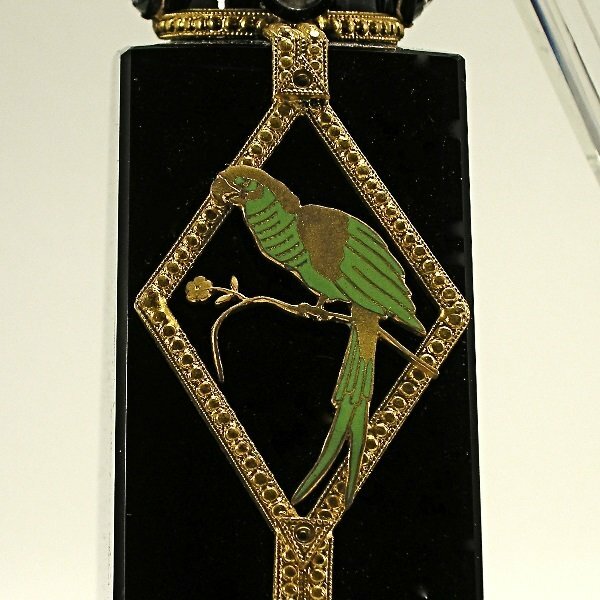 Heinrich Hoffmann was prominent among glass makers at the luxury level of vanity glass production. He and colleague Henry Günther Schlevogt (1904-1984) manufactured from their own designs, and those of famed contemporary artists. Hoffmann´s reputation as the specialist for articles made of jet black crystal was established in Paris just prior to the time of Lalique´s venture into glass. Hoffmann´s vanity pieces followed the Art Deco ethic in shape and subject, but echoed an Art Nouveau stylization late into the 1920s. Production was handled by various Czech contract factories and cottage finishers, with jeweled bronze mounting completed in Austria, and sales transacted in Paris. 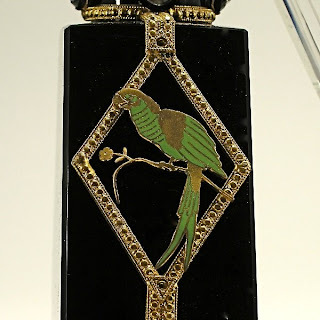 1920s perfume bottle in black crystal, clear stopper cut as a parrot, enamel and jeweled metalwork, glass feet.